We’d love your help. 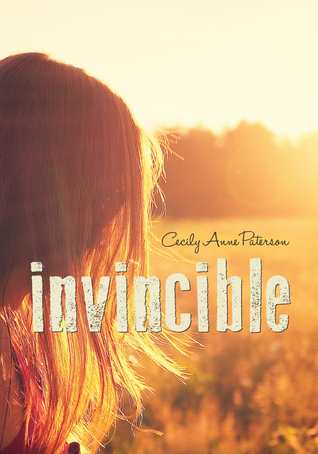 Let us know what’s wrong with this preview of Invincible by Cecily Anne Paterson. “When I was smaller I thought that at some point in my life I’d reach the top of the mountain. You know, the place where you’re finally happy. The night I got a standing ovation in the school play was the night I got to the top. Finally, everything is going right for 13 year-old Jazmine Crawford. After y “When I was smaller I thought that at some point in my life I’d reach the top of the mountain. You know, the place where you’re finally happy. The night I got a standing ovation in the school play was the night I got to the top. To ask other readers questions about Invincible, please sign up. Seit dem Theaterstück hat sich Jazemins Welt gedreht, sie hat nun Freunde und einen Jungen der auf sie steht. Im Vergleich zum letzten Jahr ist das eine deutliche Verbesserung, aber so ganz recht kann sie sich noch nicht einfühlen in ihr neues Leben. Vor allem da sie sich von Liam gedrängt fühlt. Natürlich gefällt ihr die Vorstellung, dass da jemand ist der sie bewundert, aber sie hat immer das Gefühl seinen Erwartungen noch nicht gerecht zu werden zu können und zieht sich wieder in sich selbst Seit dem Theaterstück hat sich Jazemins Welt gedreht, sie hat nun Freunde und einen Jungen der auf sie steht. Im Vergleich zum letzten Jahr ist das eine deutliche Verbesserung, aber so ganz recht kann sie sich noch nicht einfühlen in ihr neues Leben. Vor allem da sie sich von Liam gedrängt fühlt. Natürlich gefällt ihr die Vorstellung, dass da jemand ist der sie bewundert, aber sie hat immer das Gefühl seinen Erwartungen noch nicht gerecht zu werden zu können und zieht sich wieder in sich selbst zurück. Das ändert sich als sie den Kontakt zu ihrer Großmutter aufnimmt, die sie seit dem Freitod ihres Vaters nicht mehr besucht hat und ein Wanderausflug ihr so einiges abverlangt. Jazmine wächst über sich hinaus und lernt, dass nur sie Grenzen setzen kann und dass Ehrlichkeit manchmal auch weh tut. Nur man selbst kann wissen, was einem gut tut und wann man den nächsten Schritt wagt. Ein weiteres Mal durfte ich Jazmine auf ihrem Weg zu einem verantwortungsvollen Erwachsenen beobachten. Ich hatte mich so gefreut, als sie endlich mit Liam zusammenkam, daher hat mich sein bedrängendes Verhalten zunächst etwas irritiert. Hatte ich ihn doch in Band eins als süßen aufmerksamen Jungen kennengelernt. Die Wandlung erschließt sich dem Leser, nach dem er das Abschlusswort gelesen hat. Die Autorin wollte mit dieser Geschichte, jungen Mädchen zeigen, dass nur sie selbst wissen wie weit sie gehen wollen und das wenn in ihrem Inneren sich Widerstand regt, sie sich auf diese Stimme verlassen sollen. Herzergreifend ist auch die Annäherung von Jazmine und ihrer Großmutter, von der sie lernt über sich hinauszuwachsen und für andere da zu sein. Aber auch im Leben ihrer Mutter ändert sich so manches. Sie hat einen neuen Lebenspartner und kreist nicht mehr um ihre Tochter wie eine Glucke. An manchen Stellen mag das Buch für erwachsene Leser etwas zu kitschig und konstruiert sein, aber es ist eine süße Geschichte für alle Teenager die noch nicht so recht wissen wohin mit all diesen neuen Gefühlen. I don't know why but I can't seem to get this book on kindle amazon. It says I have to pre order it but I heard that it was out on kindle. This book is a must-read!!! To ayone who reads this book, my biggest suggestion is to have a couple boxes of tissues with you towards the middle-end of the book. I was recommended this book for it's fabulous teenager voice.. wow! Talk about transporting my back in time. Paterson masterfully builds her characters and sets out a story that both challenges and inspires them. This is a great book, highly recommended for teens. There are some great points about feelings, growth, relationships, friendships, and growing. LOVED! I loved the first book, Invisible, so I had high hopes for the second. While I'm normally pretty loyal, I actually found the second book to be better than the first. Jaz has come a long way, but still has a lot to learn, and I was immediately cheering for her from the beginning. I loved it! While there was huge character shift in two main characters, I felt that it was not a shocker. I welcomed the change, and I feel like it made a great book, even more interesting. It's a great book by a great author! A great book. I loved the characters and particularly identified with Jazmine, the main character. I couldn't put it down. Highly recommended for age 12 and up. I really enjoyed following Jazz on her journey of maturing and finding her way. I laughed and cried and even mentally high 5'd her. LOL Definitely worth the wait! Wow, I really loved this book! I love how Jazmine is becoming more independent. Grandma is such an interesting new character and I loved her adventures with Jazmine on the boat and up the hill. About halfway through this book Jazmine talks about how she remembers 'The Famous Five' and thinks about what they would do in her situation, and that totally made me smile because I used to LOVE the Famous Five when I was much younger. I had completely forgotten about them because I sold all my F5 books y Wow, I really loved this book! I love how Jazmine is becoming more independent. About halfway through this book Jazmine talks about how she remembers 'The Famous Five' and thinks about what they would do in her situation, and that totally made me smile because I used to LOVE the Famous Five when I was much younger. I had completely forgotten about them because I sold all my F5 books years ago, and to have that connection was really cool! There are so many more reasons why I loved this book, but I don't have much time to write! I can’t recall the last time I read a teenage novel. I may never have. I was surprised how I quickly got into Jazmine’s story. Paterson’s writing, her first person POV and Jazmine’s fragile strength soon had me racing through the first 100 pages on a return bus trip to the city. Not a lot happens in this story but Paterson excellently manages the subject matter of teenage social angst of trying to fit in while remaining true to yourself. Jazmine has two close friends, effervescent Gabby and cling I can’t recall the last time I read a teenage novel. I may never have. I was surprised how I quickly got into Jazmine’s story. Paterson’s writing, her first person POV and Jazmine’s fragile strength soon had me racing through the first 100 pages on a return bus trip to the city. Not a lot happens in this story but Paterson excellently manages the subject matter of teenage social angst of trying to fit in while remaining true to yourself. Jazmine has two close friends, effervescent Gabby and clinging Liam, her boyfriend. I loved how Paterson portrayed them both. Gabby, always moving home and therefore school, has learnt to live in the moment and not hold onto anything including her friends. Why when it will all be turned upside down again in a few short years when her family next moves. Liam is the manipulative, almost sappy boy who believes that the only way to prove your feelings for each other is via the physical. Oh, the misdirected yearnings of a pubescent young boy. Jazmine comes alive when she visits her Grandma, her late father’s mum, whom she hasn’t seen for four years since his death. Through the love and gentle guidance of her Grandma, Jazmine’s inner strength is brought to bear. It is through this self-discovery, Jazmine is able to eventually deal with the challenges Gabby, Liam and her mother throw at her later in the story. Paterson displays Jazmine’s character arc excellently and I only grew fonder of her as the novel came to a satisfying conclusion. As the story is entirely written from Jazmine’s POV I thought she dealt with some emotions and thoughts a little too maturely for a fourteen year old. However, this may reflect my lack of experience of reading such novels. Overall, it was a very satisfying read and I would happily recommend it to younger readers. Have just read this pair of books end on end. No problem finishing them. A strange experience to be enveloped in a 13 year olds world that was so different to mine - although I remember the awkwardness. Loved seeing Jazmine change over the two books and learn to be comfortable and brave in her own skin. This book would make an excellent school book for Year 7's to discuss. Raises many issues that would be good to discuss. Beautiful covers on both books. Even though this is YA fiction I couldn't put it down. Thoroughly enjoyable with some very interesting themes in it and some mysteries that keep you wondering. You have the impression of seeing a young girl discovering truths about the world around her but those truths and experiences are mirrored in your own adult world and make you reexamine and reflect on your own relationships and experiences. I loved the first book but loved this book even more! Life goes on and Jaz has many changes she must deal with. She spends time with her grandmother and encounters challenges that show her how strong she is. I love the clear voice Jaz has and adore her as a character! Cecily has written another fantastic book. I can't wait for my seventh grade daughter to read it! Cecily Anne Paterson is the author of seven novels for young teen girls, as well as an award-winning memoir for adults. Her first novel Invisible, was a semifinalist in the Amazon Breakthrough Novel Awards in 2014, and 'Charlie Franks is A-OK' won the CALEB Award in 2017. Cecily writes what she likes to call 'brave-hearted fiction', hitting some serious issues, but in an age-appropriate, clean, and Cecily Anne Paterson is the author of seven novels for young teen girls, as well as an award-winning memoir for adults. Cecily writes what she likes to call 'brave-hearted fiction', hitting some serious issues, but in an age-appropriate, clean, and helpful way, and always with a hopeful ending.